Ever wonder if someone's using your computer when you're away from it? If so, How-To Geek shows off a simple method to use Windows Task Scheduler to send out an email every time someone logs on. The process is pretty easy, and the only third-party software you need is the command line email tool, SendEmail. 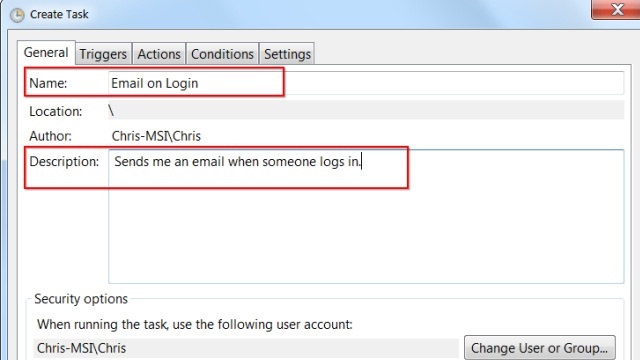 You need to create a new task in Task Scheduler, and set up a trigger so that you receive an email every time anyone logs onto your computer. If you're worried about who's snooping on your computer when you're away, you can find the full guide over on How-To Geek. Once you learn someone is logging in, it's easy to figure out who it might be. Pretty clever trick but the System has to be online as well .. Though something like this might come in handy .. I have to give my laptop for repairs and I am wee bit paranoid about all the data/personal-info that I have stored on the laptop. I am uncomfortable with leaving it with Service Center people. I plan to backup and delete all my files .. but the browser stuff and address books are all there in Windows so I'm a little wary. Can I leave my system password protected .. ? ?